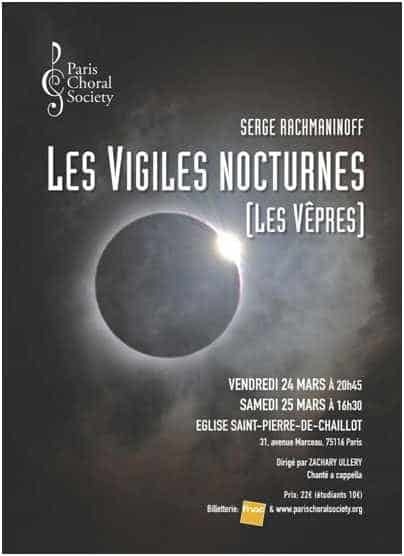 The Paris Choral Society pays tribute to the most Russian of the American composers by interpreting his greatest choral work composed for the Orthodox Church: Всенощное бдение (Vsenochtchnoïe bdeniye – “Nocturnal Vigils”) opus 37. In this swan song of Russian liturgical music – before its extinction with the Revolution of 1917 – Rachmaninoff delivers, with the poetry and refinement that characterize his style, the richness and depth of his “Russian soul”. There are the bell chimes of the churches of Novgorod from his childhood and the deep bass voices of the Russian choirs, which he makes descend to a low B flat. And then there is the polyphony of 4, 6, 8 … up to 11 voices, that shine through in ancestral melodies drawn from the Russian, Byzantine or Ukrainian tradition, alternating with Rachmaninoff’s own melodies over the 15 movements of the Vigils. This “liturgical symphony”, as referred to by the critic Johann von Gardner, glorifies the rites and rituals of the mass from Saturday evening to Sunday morning, or the eve of the Feasts, which this celebrates. It is incorrectly named Vespers and is actually composed as a vibrant and solemn diptych, of which the Vespers (evening office) constitute only the first part: a call to repentance and introspection, where the Light of Christ symbolically shines through an abundance of harmonic and contrapuntal effects. The celebratory Matins of the second part then rise in a dramatic and monumental vision of the Resurrection, and end in a tender praise to the Mother of God, respecting the Russian Orthodox liturgical traditions. The Paris Choral Society has chosen to perform these concerts in the church of Saint-Pierre de Chaillot, whose exceptional acoustics will reveal the subtleties and extent of the nuances and richness of the choir, as well as the expressive depth of the Russian Orthodox chant, to which Rachmaninoff renders this stirring homage.